When Monika and Christopher Frelian discovered the stones beneath the floorboards near Kielce, the Hebrew engravings testified to their origin and they soon returned them to a Jewish cemetery. 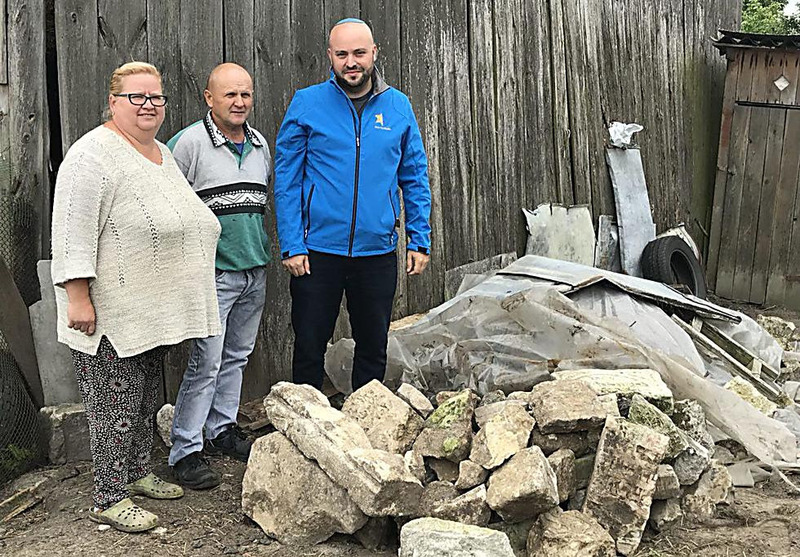 While overhauling and organizing their large yard, Monika and Christopher Frelian, residents of Klępie Górne, a Polish town near Kielce, were shocked to discover that the floor of their barn was paved with Jewish tombstones. Just as they began tearing down their old barn, Monika noticed “something weird” in the paving stones placed below the barn’s wood floor. “The stones were covered with decades worth of dirt. 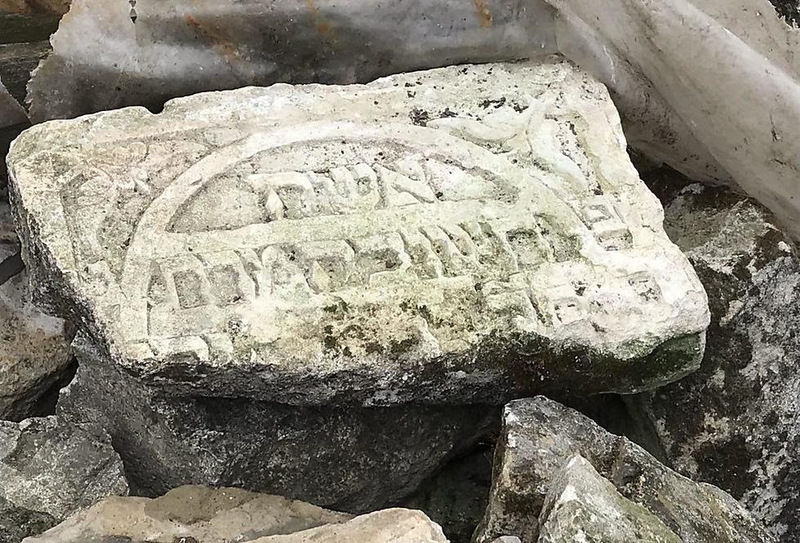 Only after the rain and wind washed the grime away was the Hebrew writing on the stones revealed,” she said, adding that she knew she had to return them to their natural place, she told a Ynet reporter. Kielce, about a 2.5 hour drive from Warsaw, was a thriving Jewish center before World War Two. About 20,000 Jews lived in the city before the Nazis moved them into the ghetto. Most perished in Treblinka. Monika and her husband gathered all the stones etched with Hebrew writing and placed them in a corner of their yard, between the chickens, rabbits and cows, as a sort of monument. They covered the stones with plastic to avoid further damage. “About a year ago I saw a similar incident on a television program and I recalled the name of a Jew by the name of Jonny who spoke about how important it is to return the stones to a Jewish cemetery. I sought him out and eventually got hold of him,” Monika told the reporter. Jonny Daniels is the chairman of Mimaamakim (From the Depths), an organization dedicated to preserving the memory of the Holocaust and Jewish culture. Monika called him and “begged that we come and gather the stones. She believed that if she did not find a solution for them something bad would befall her,” he said. It is believed that during or after the war, Jewish graveyards were used as a source for raw material and gravestones were used as paving stones. Monika’s parents bought the property about 50 years ago, after the barn was already built. They probably had no idea about the gravestones in the barn. About two weeks ago, in the midst of a light rain, and as if to give the event an emotional touch, Daniels organized a group of volunteers to travel to the Frelian home and “do the last mitzvah (good deed),” as he put it. The Frelian couple were excited to see the small delegation at their home. The stones were apparently taken from a number of different tombs and while connecting them proved impossible, the engravings left no doubt as to their origins: “The memory of the righteous is blessed,” “May his memory be a blessing” and other fragments of Hebrew sentences attested to the purpose they once served. After an hour of collecting the stones, weighing a few hundred kilograms, the final task was to find the nearest Jewish cemetery. After a few phone calls, one was found about 20 minutes away in Busko-Zdrój. The cemetery there looked well groomed. Daniels spoke to the custodian, who was not in the area, and it was decided to place the stones at the gate of the cemetery and he would arrange for them to be placed in a proper place.